There are some rumours you hear about and really hope they come true. You keep a lookout over weeks and months hoping the news will suddenly hit the headlines. Well this week it did. After over a year of anticipation, Google has officially announced Dynamic AMP pages for Email. The new framework brings emails to life, allowing you to interact directly without ever having to leave your inbox. Think about a regular email. You receive a message, look at the static words and/or imagery and perhaps click through to a website to see more. Now imagine you open an email and can scroll through a product rail, add a Pin to your board, click to view more details or fill out a questionnaire. That kind of interaction is exactly what Dynamic AMP for Email brings – and it’s not hard imagine the whole new world of opportunities this will open up for marketers. Now available for Gmail desktop, the new spec will also soon expand to other major email providers across the world, including Outlook.com and Yahoo Mail. 2. Instagram tests video scrubbing, but is this actually good news? Regular Instagram (non-IGTV) videos have a 60 second limit. And although this doesn’t sound very long, have you ever wished you could skip to a certain part without having to watch the whole thing? It’s a frustration shared by many Instagram users, and one it looks like the platform could be soon set to squash. Reverse-engineering specialist Jane Manchun-Wong has spotted a video “scrubbing” feature in the app’s code. It lets you swipe across a progress bar to skip to specific points within a video. Most Facebook videos already have this feature. But of course, videos on Facebook aren’t nearly as time-restricted, so you could say the need is greater. Look, there’s no doubt this will be popular if rolled out – and I’m always in support of updates that give users what they want. I just hope it doesn’t make life more difficult for advertisers. If people watch your entire video, then skip back to the bits they want to see again, that’s great. No issue there. But if people start jumping around right from the get-go, core messages could easily get lost/diluted/confused. I guess though, this will ultimately act as another reminder to create highly engaging content that captures attention from the very first fractions of a second – and that’s definitely no bad thing. Personalisation platform Fresh Relevance has released the findings from a social proof study, which extensively researched 50 IRUK Top 500 retailers and 2,000 British consumers. The aim? To find out what customers expect in terms of social proof, and which tactics help lead to a purchase. There are definitely some interesting takeaways here. Although the study is UK-based the key points are worth considering for everyone. It was just last week I let you know about Snapchat’s upcoming in-app gaming announcement. This week brings similar news from seasoned copycat Facebook, which has unveiled a dedicated Gaming tab in the main navigation bar. 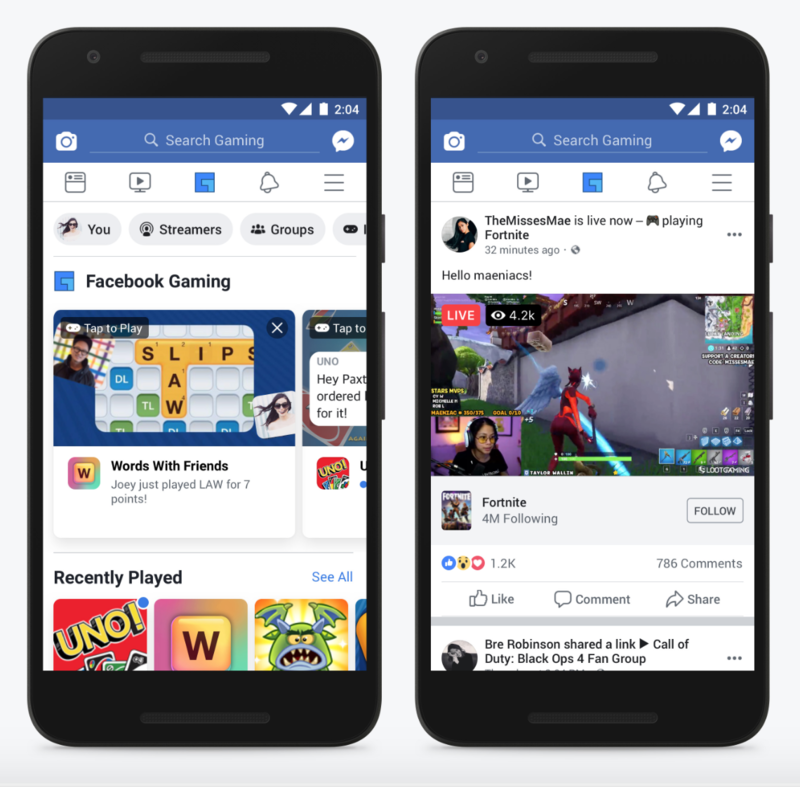 Facebook says there are over 700 million people playing games, watching gaming videos or engaging on gaming groups each month – this new tab is designed to make it easier for them to find and connect around their favourite games. It will roll out to a small subset of this group. Facebook also confirmed it’s still beta testing a standalone gaming platform on Android. 5. Proof that you need to emotionally engage with your audience, and we’re talking to you too B2B marketers! A high focus on sales should never mean a lack of focus on the people behind the purchases. In fact, it should be the opposite. Caring about and connecting with your customers/potential customers is one of the most powerful ways to achieve high revenue long term. And a big part of doing that involves understanding them at a psychological and emotional level. But guess what? Only 15% of customers say that brands do a good job of emotionally bonding with them beyond a functional relationship. A new study by Pan Communications has taken a closer look at this subject matter. What’s most interesting is that they focus specifically on B2B – a domain that many might think is more logic than emotion based (not the case! ).